I love you. Seriously. Each and every one of you, from the very bottom of my heart. I’ve watched you grow, the blogroll getting longer and longer each month, and I’ve savored the challenges, looking at every elegant photograph and memorable post with admiration and just a touch of envy. In complete honesty, Daring Bakers, you were out of my league. Perhaps I could make a food blog, but never could I make the same desserts as you – challenging, beautiful, time consuming, potentially expensive – it was not in the cards for an amateur 17 year old who fancied herself a foodie. 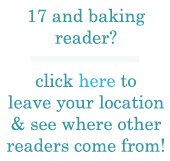 Lucky for me, Daring Bakers are the warmest, friendliest bakers around. I still can’t quite believe that I am a Daring Baker now, and that I’ve finished my first challenge. Actually, this might be a daydream. I could potentially be in 5th period English. Don’t wake me up. After recovering from the wild crazy joy that was being accepted into the Daring Bakers, I went absolutely insane waiting for the April challenge to be announced. I won’t lie – I felt scared that it would be a fancy French pastry that I would completely defile, and that would be the end of it. But I’d made cheesecake twice before – plain cheesecake – and was eager to try more exotic flavors and see how this recipe compared with mine. I must have played with a dozen different ideas. A spicy Mexican Hot Chocolate cheesecake, green tea and white chocolate, blood orange and champagne, even basil. When I brainstormed aloud about coconut to my parents, my dad said “Thai.” And it all came together. 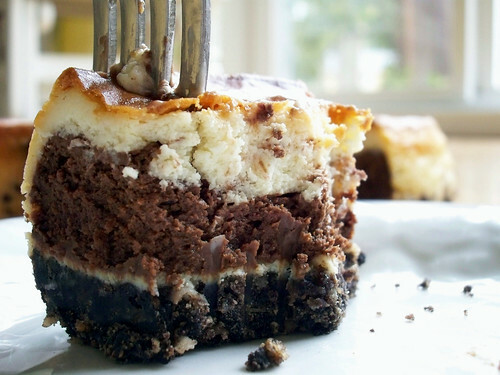 Chocolate Marble Cheesecake with Coconut, Lemongrass, and Kaffir Lime. And yeah, that tiny bite is what’s left of the slice from the picture before. I actually stopped the photoshoot to eat the cake I was photographing. Then I guiltily set down the plate and picked up the camera. This cheesecake is just that good. It’s a bit Asian inspired. Coconut, lemongrass, and especially kaffir lime are all characteristic flavors in Thai cooking. And the chocolate? You can’t go wrong with that. It pairs really well with the coconut. The flavor wasn’t as strong as I’d expected, but it was lovely. The coconut is definitely the most prominent, it hits you after the first bite and says “Coconut.” The lemongrass is more subtle. The lime is probably the faintest flavor, not something easily pinpointed but definitely tasted. The chocolate – well, chocolate is always divine. I didn’t use too much because I was worried about overpowering the otherwise delicate flavor of the cheesecake, and I think I hit just the right balance. This was a great cheesecake recipe. It was creamy, though not quite as heavy as the cheesecake I’ve made before. My mother, who doesn’t care for anything richer than chiffon cake, proclaimed it one of her all time favorites. She was just as reluctant as I was to donate it to her office before we ate the whole thing. It did crack, though this is probably my fault – I opened the springform pan way, way, way before the cheesecake was done. I also may have overmixed the batter, as I usually do it by hand but used a mixer this time, as per the instructions. 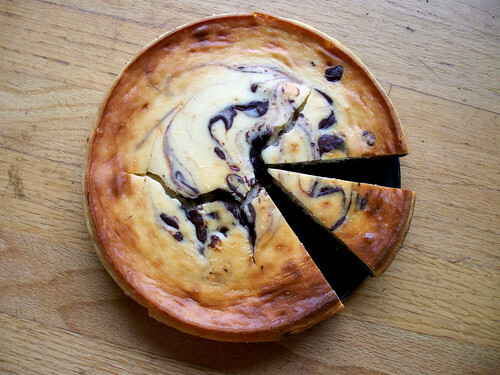 I still think the cheesecake looks gorgeous. I didn’t even cover it up with a ganache or fruit. I proudly displayed that crack along with the honey-golden edges and the mysterious chocolate swirls. No one complained. Changes to the recipe: To add the Thai flavor, I used 1/2 cup heavy cream and 1/2 cup coconut cream rather than the full 1 cup heavy cream called for. I infused the creams with lemongrass and kaffir lime leaves, and used lime juice instead of lemon in the cheesecake too. I didn’t want to buy coconut extract, so I used vanilla. I also didn’t want to buy coconut or lime liquor, so I omitted the alcohol. The crust combines the Thai and chocolate: crushed chocolate cookies, cocoa powder, and shredded coconut. I left out the sugar in the recipe because the coconut was sweetened. As for the chocolate swirl, I simply melted bittersweet chocolate and mixed it into about 3/4 cup of the chocolate mixture. The cheesecake probably would have looked nicer with more chocolate swirls, but this ratio kept the coconut, lemongrass, and lime flavors more than an afterthought. A big thank you to Jenny for hosting such a great challenge, as well as all of the daring bakers for their inspiration and friendliness. 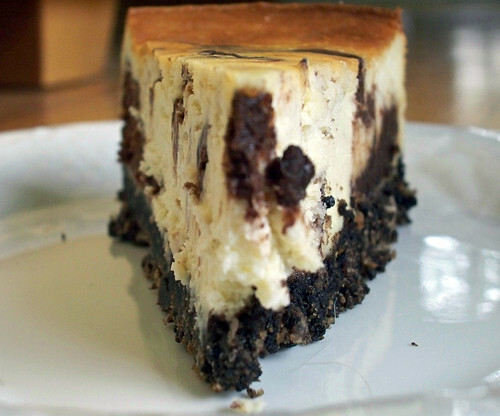 I really encourage you to check out everyone else’s cheesecakes too. They’re nothing short of amazing. Preheat the oven to 350 degrees F and begin to boil a large pot of water for the waterbath. Generously butter a 9″ springform pan. Wrap the outside of the pan in a extra-heavy duty aluminum foil. Chop up the lemongrass stalk into inch sized pieces, breaking the layers apart and reserving the juices. Place in a small saucepan, along with the heavy cream, coconut cream, and dried kaffir lime leaves. Heat over medium-high heat until mixture boils, then remove from heat and cover. Let steep until cooled completely. Strain the cream into a small bowl and set aside. Discard the lemongrass and lime leaves. Place the chocolate graham crackers in a large ziploc bag and close it so it’s airtight. Roll a rolling pin over the bag, pressing down to crush the crackers into fine crumbs. You should end up with 2 cups of crumbs. Mix together the crust ingredients and press into the bottom of the springform pan. [I like to use a metal measuring cup with a flat bottom and straight sides to help pack the crust in.] Set the pan aside. 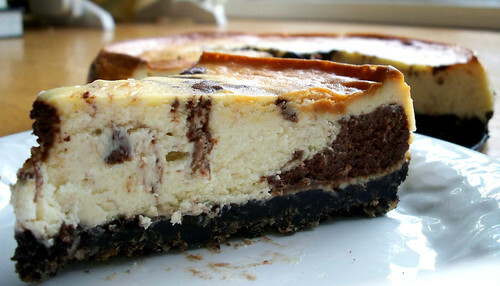 Take 3/4 cup of the cream cheese mixture and mix it with the melted chocolate. Pour a third of the white batter into the prepared crust. Drop in half the chocolate batter in tablespoon sized dollops across the white batter. Smooth the remaining 2/3 of the white batter into the pan. Dollop tablespoons of the remaining 1/2 chocolate batter across the top. Run a sharp, thin knife or bamboo skewer through the batter for a swirled effect. Tap the pan on the counter a few times to bring all air bubbles to the surface. Set the springform pan inside a larger pan, then pour the boiling water 1 inch deep between the larger pan and the foil. Don’t pour the water between the springform pan and foil. Bake 45 to 55 minutes, until it is almost done – this can be hard to judge, but you’re looking for the cake to hold together, but still have a lot of jiggle to it in the center. You don’t want it to be completely firm at this stage. [50 minutes is perfect for my oven.] Close the oven door, turn the heat off, and let rest in the cooling oven for one hour. This lets the cake finish cooking and cool down gently enough so that it won’t crack on the top. After one hour, remove cheesecake from oven and lift carefully out of water bath. Let it finish cooling on the counter, and then cover and put in the fridge to chill. Once fully chilled, it is ready to serve. My first DB Challenge, ta-da! I can’t wait for May! Entry filed under: Cake/Cupcakes, Daring Bakers. Tags: cheesecake, chocolate, coconut, cream, cream cheese, creamy, Daring Bakers, lemongrass, lime. s also good to know if they do other work besides web design. win the attention of your target audience. Terrific article! Thhat is the kind of infomation that are meant to be shared across tthe internet. com, which has become one stop store for designer Indian wear. insight into the world of fashion in her blog. When’s the last time the actual Elton John completed that for you. new equipment should be requested. Kourtney Kardashian is a well-known celebrity fashion guru. Hmm is anyone else experiencing problems with thee pictures oon this blog loading? out my website tooo and tell mme what you think. to be done, then it would be a good idea to get all the details down in the contract. place. Books have often been a tremendous supply of knowledge. fit right through it without any gaps along the outside. can learn basic plumbing work, and save a good amount of money. increases in cancer rates, low birth rates and low sperm counts. and break through a sewage line. in parks or even in locations with lots of natural views like beaches. part of the original safari market, which has sadly left it in quite a state. flexible and respond by adapting to the changing situation. surf coach, Ulisses, will have you with the best spots and also have you standing in no time. causes discolouration and a change in hair texture. much on moving, the moving service provides the facility of a trailer. Camps can help build confidence by enabling them to improve their skills and making new friends. types of health insurance. However as we get older our bad habits can affect our health in many ways. the next step. Young children use their senses when learning skills. promote heart health and just plainly keep you active. to work). The American Board of Plastic Surgery, retrieved from website on February 18, 2012.
how Accountant Burnsville can benefit you. Prepare an application for Tax-ID number, if needed. 400 acres in Blue Ridge Mountains in Cedar Mountain, North Carolina. Here are some of the best Houston, Texas Summer camps for your child to develop or pursue their interest. camp is a unique experience. in a short time of training in Thailand with Muay Thai. & for most the wedding planning will also include loosing weight & toning up in vital areas. There is so much that one can do during a camping trip. This is what you require ultimately to reduce weight as well. promoting healing, good blood circulation, and fortified capillary walls. Quality posts is the secret to be a focus for the users to pay a visit the web page, that’s what this web page is providing. are now harnessing the potential of this tool for their specific purposes.